Twins Max and Emily at the top of their class and love absolutely everything to do with dancing. All of their hopes and dreams hinge onbecoming professional ballet dancers. Then, the unthinkable happens. They lose their parents and their whole lives are turned upside down. Aunt Kimberly arrived the night before the funeral…They should have known then that things weren’t going to work out the way they had imagined. Aunt Kimberly isn’t the same. Their once jovial aunt is now somber and silently furious. For the first time, Max and Emily will have to fight for their aspirations. 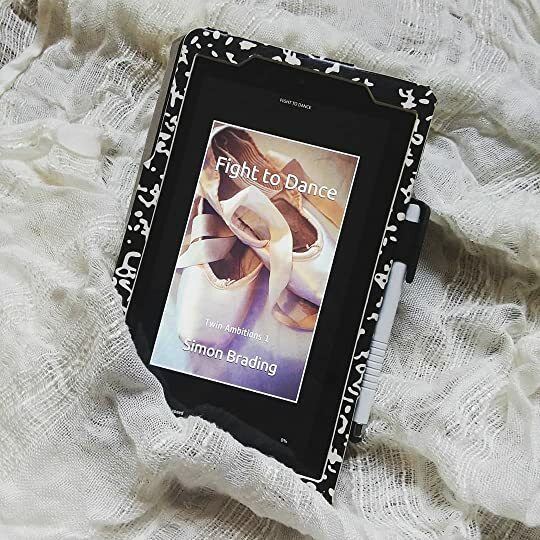 This is the first time in which I read a book about a boy dancing where the main conflict wasn’t “boys don’t dance.” Talk about refreshing.Max is never told that dancing is lame, or girly, or gay, or whatever easy argument is thrown at boys who like to dance. His sister and family are encouraging, and even evil Aunt Kimberly doesn’t belittling Max’s male-ness by making fun of dancing. Despite all her faults, she is at least equally cruel to both children. I thought this book dealt with grief in a thoughtful and age-appropriate manner. And the book didn’t dwell too long on the sorrow, there were plenty of happy moments to keep it from being depressing. Now, I have lived in America my entire life and I can assure you that this uniform looks nothing like the ones we wear. From my first days to senior year, every uniform I wore had red and white striped pants, with a bedazzled blue jean jacket, and a tie with no less than fifty stars (it was a really, really long tie) (we’d use it as a lasso in between periods). Joking aside, I enjoyed reading this book and look forward to the sequel!